Severe weather outbreaks are synonymous with the spring season, but there is an ever-so-slight increase in activity in the fall as well. As the days grow shorter and the weather turns cold, the insurance industry needs to remain on guard, as this is the height of the second severe weather season. Spring marks the shift from brutal cold to relentless heat, and the United States is often sharply divided between warm and humid weather in the south and cold and dry conditions to the north. The steep temperature gradient allows the jet stream to dip farther south, creating more opportunities for severe weather outbreaks to unfold. As the country becomes uniformly and increasingly warmer in the summer, the relative lack of a temperature gradient usually pushes the jet stream far enough into Canada that it tends to only affect the northern part of the United States. This retreat of the jet stream allows the severe weather season to calm down – not completely, of course – but usually prevents the intense outbreaks of severe weather often experienced in April, May and June. When fall rolls around and the country again starts to experience wild swings in temperature, the jet stream dips south once more and allows weather systems to develop and interact with the warmth and humidity. This results in spring-like severe weather outbreaks complete with a second spike in tornado activity, which is often accompanied by other types of severe weather. 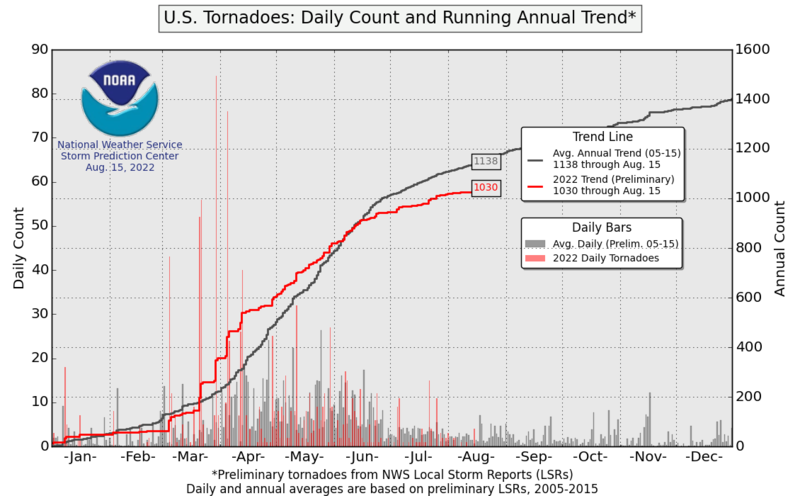 The chart above shows monthly tornado reports between 2008 and 2017. To help illustrate this second season of severe weather, the overall monthly reports have been capped at a maximum value of 300. While total tornado activity varies widely from year to year, every spring produces a pronounced spike in tornado activity which is why we have capped the graph above at 300. This spring peak also provides the insurance industry with its primary season for severe weather loss. However, in each fall season between 2008 and 2017, highlighted in the red arrows, a clear secondary spike in tornado activity has occurred. While some of these fall twisters are a result of landfalling named tropical storms, most of the outbreaks are the consequence of the same processes we see during spring severe weather events. Some of the fall tornadoes can be particularly strong. In 2013, several tornadoes impacted Illinois, including an EF-4 tornado that hit the small town of Washington. This round of severe weather caused almost $1B of loss to the insurance industry. This case was unusually rare as, typically, severe weather takes aim at the southeast, and the overall fall losses to the insurance industry are much smaller in total value. Typically, by the end of October, 98% of the 10-year average annual insurance industry loss in the U.S. has developed. Similar to the trend in severe weather reports, there is a small, but noticeable, increase in secondary severe weather insured loss data for both the 10-year average annual loss and the number of events for the month of October. The second season has been quite active this year, with several notable bursts of severe weather activity. The most active tornado report day of 2018 (so far) was Halloween night, with 61 tornadoes occurring, breaking the previous record of 51 which occurred on April 13. Of course, an exceptionally quiet spring season likely helped to contribute to this unique scenario. What is also unusual is that, thus far, Property Claims Services has yet to issue a Catastrophe Bulletin for this outbreak from October 31 – November 2. 2018 Tornadoes: When they happened, and when they didn’t happen. Of course, an exceptionally quiet spring season. Below is a look at when severe weather associated with tornadoes happened this past year. Here are the annual anomalies of 2018 tornado days to-date. Tornado alley, as it’s popularly defined geographically, is entirely below-average, but parts of Louisiana and most of the East Coast of the U.S. have been above-average. In fact, almost as many tornadoes have occurred this year in New England (19) as in Oklahoma (22), which adds to the noteworthy severe weather year that has transpired. Preliminary data suggests the state of Connecticut has had nine tornadoes this year – the most on record. The tiny state of Rhode Island has had one tornado, which tied for the most to have ever occurred during a calendar year. In Pennsylvania, 31 tornadoes were reported, which is the highest annual number in 20 years. The U.S. is currently in a major tornado drought. There has never been a year since 1950 that has passed without an EF-4 or EF-5 tornado occurring, but this scenario is appearing likely this year as, currently, the U.S. is in its longest stretch without a violent EF-4 tornado and closing in on the longest stint without a destructive EF-5 tornado. This year’s severe weather looks to be completely average when compared to the last 10 years in terms of insured loss, barring any major severe weather outbreak over the remaining 48 days in 2018. 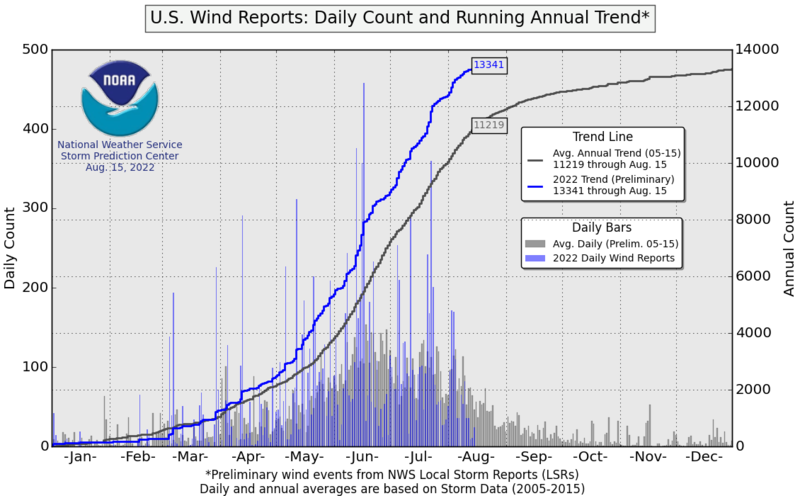 After a quiet spring, tornado activity has been playing catch-up during an active second season, with severe storm reports of wind following the 2005 – 2015 average count. 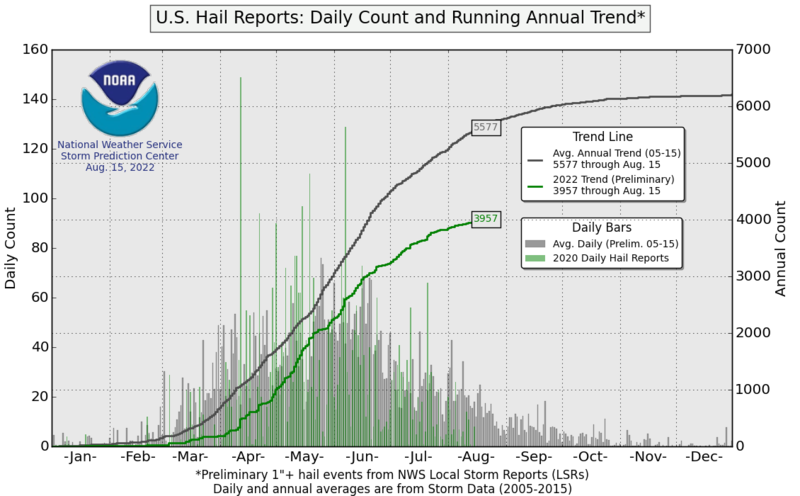 However, hail reports, which are not as common in the second season and over the winter months, will likely end up being well below the 2005 -2015 average report count. With the impending El Niño for the winter of 2018 – 2019, one should expect an active storm track across the southern states with greater-than-normal severe weather across the Southeast including Florida. Although we are already potentially seeing this pattern of severe weather, not all El Niños are the same. As details emerge, more insight will be provided on what to expect for the winter and spring severe weather seasons across the Southeast states which could be more active than normal.